Hypothetically speaking, I would be begging to get into the Animal Collective concert at Koko's tonight, stealing to get into Ronnie Scotts to hear amazingly talented musicians play tracks from the fantastic Kind of Blue by Miles Davis which is celebrating it's 50th year as is Ronnie Scotts and borrowing to get in for a second night at Ronnie Scotts for more Miles magic. When I was a penniless student I spent many a night sitting around in basement Jazz clubs with my friends, usually huddled round one little bowl of ice cream with five spoons enjoying the free music and the warmth. I made it to Ronnie Scotts once, saw the man himself perform, it was a really nice evening. 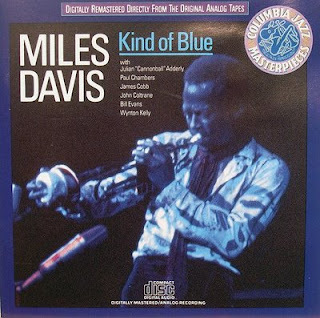 Thanks for the link, very interesting read - I didn't know that the group had never played those pieces prior to the recording of A Kind of Blue - that's truely awesome! no worries chalky, I'm perfectly safe. Its just that I'm sick of blogging everyday and have decided to compile them all once my trip is completed! Would be back home in about 2 days. Kinda sad that I'd be heading back for the daily grind!